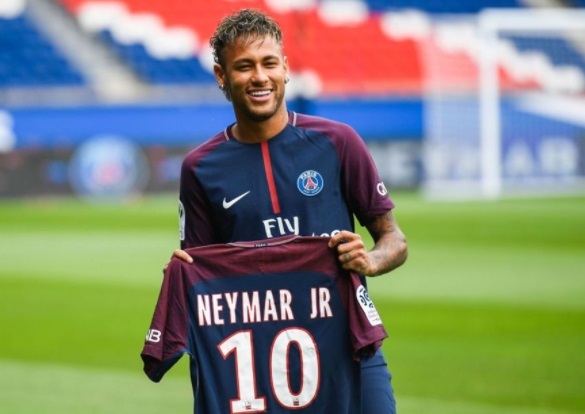 Paris Saint Germain brought in Neymar JR after paying his release clause of €222 million (£198m) but in reality it will cost them around €500 million over the course of massive 5 year contract to Neymar. PSG has handed out one of the most expensive contract in world football to Neymar who will take home atleast €296 million over 5 year period. This new deal put Neymar in the same pay league as Lionel Messi and Ronaldo who both have after tax deals with their respective clubs. We take a look at Neymar salary his and his current net worth. With his move to PSG, Neymar became the highest paid footballer in the world getting a salary €565,000 a week guaranteed plus bonuses with his 5 contract. His 5 year deal is believed to be worth around €296 million but that is not the only source of income for Brazilian who is also in the same league as Ronaldo as far as endorsement are concerned. Neymar’s already have whole list of endorsement deals under his belt where he makes around €25 million a year currently from all sponsorship deals. The most prominant one is the 11 year contract with Nike worth €100 million (€10 million a year). Other deals include Beats By Dre headphones, Police sunglasses, Gaga Milano watch and countless other domestic brazilian brands. Neymar Jr Salary: 5 year contract with PSG is worth around €290 million thats around €565,000 a week in salary. We take a look at his salary history since his move to Barcelona from Santos. August 2017 Completed his transfer to PSG who paid €222 million release clause and Neymar signed a 5 year contract worth €296 million. October 2016 Neymar signed financially improved 5 year deal with Barcelona worth €17.5 million a year. There were performance bonus and image rights details added to the contract which would add another €5-8 million yearly. August 2013 Neymar completed his £71.9 million transfer from Santos to Barcelona and signed a bumper contract making him around €10 million a year. Barcelona will hope that new Neymar deal will finally end all the speculation about his future and he can focus on the season where Barcelona now move to a very busy couple of months. Barcelona signed Neymar for a disclosed £71.5 million back in 2013 and since than his stock has rose to different levels. Manchester United allegedly made a £160 million offer in summer 2016.